We have long believed in the power of trigger mail to improve the direct marketing trifecta: customer acquisition, customer engagement and customer loyalty. In fact, my colleague Debora Haskel wrote about how trigger mail was revolutionizing the direct marketing landscape back in 2010. Today we wanted to answer a few common questions to help you decide if trigger mail is right for your direct mail efforts. Trigger mail is defined as marketing mail “triggered” by a significant life event that drives a change in a person’s need for a specific group of products or services. Think of a young couple having their first baby, a family moving into a new home, or a person beginning retirement. As marketers, we want to be the first to offer all the toys and tools that go with that new life experience, because we know these prospects are more likely to buy when a new life status has created a range of unfulfilled needs. That’s why trigger mailings are so time sensitive and often produced in condensed production cycles. They can be used in nearly all types of marketing (see the above trifecta), but are generally most effective when used within existing customer groups. A trigger program based on customer data sent at precisely the right time can drive a higher response rate as it is especially relevant and timely – certainly more so than a blanket communication to an unqualified audience. The amount of lift in response is dependent upon a variety of factors, but results almost always exceed non-triggered communication. What qualifies as a trigger? Nearly all industries could deploy triggers for acquisition, loyalty or engagement. For example, financial, insurance and mortgage clients may use a change of address to position a product or service. An automotive client may use data that corresponds to buying a new vehicle or a car with an expiring lease. Retail may use specific purchasing activity to engage a customer with a loyalty award. Healthcare may use an age milestone to bring awareness to a special service recommended to the patient. You get the idea. In many cases you are only limited by your imagination. How long does trigger mail take to be produced and delivered? This depends on the client, type of trigger and overall marketing strategy. One common denominator is that triggers, by nature, must be produced and delivered on a timely basis so the offer or announcement stays relevant. Some triggers require tighter turn times than others, but nearly all triggers require some form of a compressed cycle time from traditional cycles. Is trigger mail a standalone strategy? 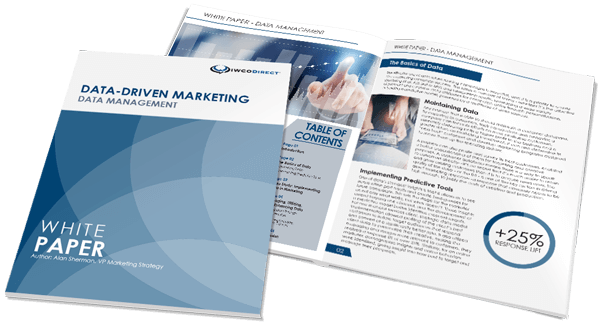 Most often trigger mail is used to augment or complement a broader direct mail strategy. Triggers can be a bit more costly as they are driven by specific data requirements and generally need special production environments to be successful—so careful planning is important. Beyond the data and strategy requirements, understanding production and postal delivery cycles will really help in defining the program. It’s also a good idea to define clear service level agreements to ensure success. In order for trigger mail to be successful, the message and offer must be timely and relevant. Standard direct mail best practices apply including testing of offers, timing and messaging in order to refine and improve results over time. Once again, it’s all about delivering the right message, to the right person, at the right time—and trigger mail brings direct marketers one step closer to doing just that.